To use, to read books without owning them. In comparison with a public library for example the users have no commitment to the library. 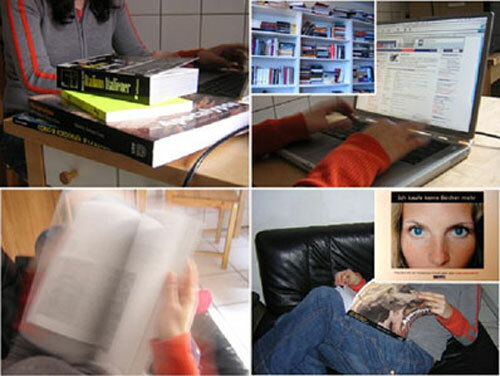 Efficiant combination beetween reading tangible books and using information technology as internet. The story The interesting point is that our opinion was that the story they tell on the website »circle of friends invented web exchange platform for fun and community reasons« is only a story people like to hear. But it seems to be true and the stunning fact is that the actors (5 people) never thought about in advance in the big success and the permanent increasing number of members. 18.000 members In the beginning they thought they have to fake personalities on the platform to attract other possible users. This was not necessary and after 2,5 yrs about 18.000 members use the platform actively. This number is still increasing without any marketing and ads. Perfect interface, very complex service offers which to maintain needs very low effort. The programming of such a solution, if the structure is clear, needs about three days. The solution providers think about an extension abroad and the additional offering of an exchange platform for DVD, software and media products. A network of friends and supporters provides service and web hosting. The platform earns no money. It is planned to expand the offer also to DVD, music and other media. This will probably start next year and depends in its realisation on the cooperation of professional partners and the legal circumstances concerning the copyrights. The legal problem within exchanging books is the VAT. Society benefit could be the counciousness that sharing things (using instead of owning) also creates a space for communication and service. An interesting point is that without a technical platform this service would not be possible and also without the community and chat functions people would not use the service. So with information technology and community tools you can spread (sustainable) ideas. Probably not less books are produced. Statistically people buy or borrow a new book when the just finished a nother one. So much reading creates much more reading interest. But throught this the idea of using instead of owning diffuses into peoples minds. Statistically people buy or borrow a new book when the just finished a nother one. So much reading creates much more reading. Exchange services are not replacing trade – they support trade!